Sharon Keller, presiding judge of the Texas Court of Criminal Appeals, should be suspended from office pending the outcome of the State Commission on Judicial Conduct proceedings against her. She faces a public hearing on June 18, but she should be suspended before the hearing. If she is suspended, the hearing and formal proceedings would continue on schedule but she would be suspended from performing her duties as judge. Click here to sign a petition urging the State Commission on Judicial Conduct to recommend Sharon Keller be removed from office. She has already been fined $100,000 dollars by the Texas Ethics Commission for 13 violations equivalent to misdemeanors. She may have committed more violations but the statute of limitations has run on some of her past behavior. She may soon face criminal charges, according to a post on Grits for Breakfast. Rule 15(b) of the Procedural Rules for Removal or Retirement of Judges on the website of the State Commission on Judicial Conduct allows the Commission to request that the Supreme Court of Texas suspend a judge if a sworn complaint is filed. Keller could also be suspended under Rule 15(a) if Travis County Attorney David Escamilla files criminal charges against her. shall notify the judge whether the suspension will be continued, terminated, or modified. suspension of such person from office. It is time for the Commission to recommend that the Texas Supreme Court suspends Sharon Keller until the formal proceedings are complete and the Commission votes to either dismiss the case, issue a public censure, or recommend to the Supreme Court that Keller be permanently removed from office. Now that she has been fined $100,000, we should expect to see a round of newspaper editorials coming soon saying she should be removed from the bench. The Commission charged Keller in the Amended Notice of Formal Proceedings with 1) “willful or persistent conduct that is clearly inconsistent with the proper performance of her duties as presiding judge”, 2) “willful or persistent conduct that casts public discredit on the judiciary or the administration of justice”, 3) “incompetence in the performance of duties of office”. Those are the exact reasons given in Rule 15b for suspending a judge. The Commission should immediately begin the process to recommend that the Texas Supreme Court suspends Keller. 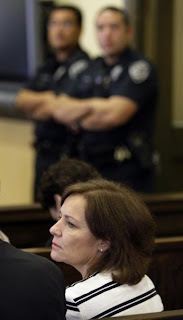 The proceedings against her including the June 18 public hearing will continue, but in the meantime she should not exercise the powers of her office as a judge on the Court of Criminal Appeals. The other option that could have achieved Keller’s suspension was for the Texas House to vote to impeach her, as Rep Lon Burnam tried to do when he filed a resolution to start that process. If she had been impeached by the House, she would have been automatically suspended pending the outcome of her Senate trial.